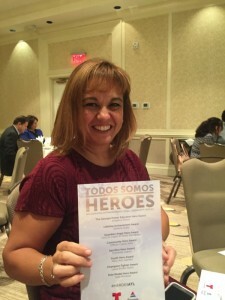 DCSD Family Engagement Facilitator Named a Local Hero by Telemundo Atlanta. Angelica Rosso, the Region 1 Family Engagement Center Facilitator for the DeKalb County School District (DCSD), was honored as a local hero at Todos Somos Heroes 2017, which is a signature luncheon sponsored by Telemundo Atlanta. Todos Somos means “we are all heroes” in Spanish. The ceremony acknowledged local heroes who are making an extraordinary impact in their communities. Rosso was named a hero for her work with DCSD. Her duties include assisting families with supporting the education of their students, and building bridges between the district and community. Telemundo Atlanta has posted this special video honoring Rosso. Ross said the award carries a special place in her heart.